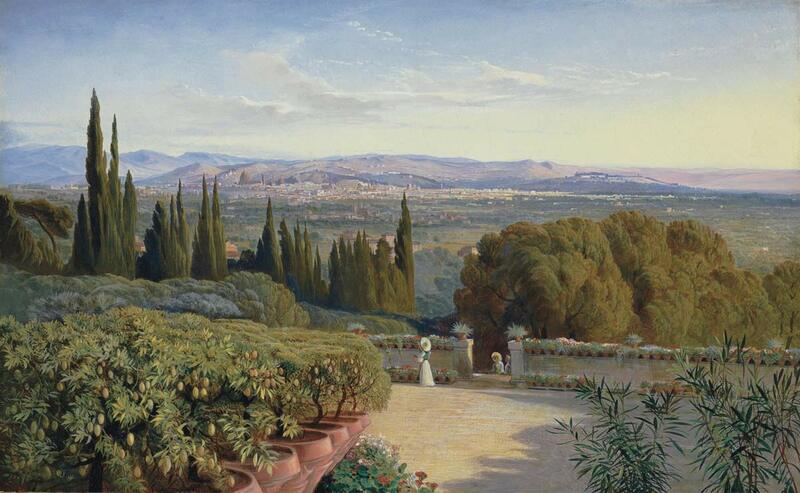 Edward Lear, View of Florence from Villa Petraja. ‘At present I am at work ferociously on the Petraja & I must say it promises well. I worked on the large lemon trees in pots all yesterday, & to-day must fidget over the houses all the long hours. No life is more shocking to me than the sitting motionless like a petrified gorilla as to my body & limbs hour after hour – my hand meanwhile, reck peck pecking at billions of little dots & lines, while my mind is fretting & fuming, through every moment of the weary days work.’ Lear’s letter to his friend Chichester Fortescue, written on 29 August 1861, reports on his progress with his painting of Florence from Villa Petraja. It expresses, with the typically quirky humour for which he is widely known, the painstaking efforts with which he strove to complete his oil paintings to the satisfaction of his clients. By late September he had ‘made the view from Villa Petraja all but a reality’ and by 12 October it was finished (L.E.L., 1907, pp. 189, 196, 199). The painting of Florence from the gardens of the celebrated Medici Villa La Petraja had been commissioned by the prominent whig-Liberal political hostess Frances, Countess Waldegrave (1821-1879), a staunch supporter of Lear’s and for whom he made six other paintings (including Jerusalem from the Mount of Olives, Sunset, see lot 9). Then married to the elderly but well-connected George Harcourt, she was surrounded by younger admirers and the particular focus of the affections of Chichester Fortescue, who had introduced her to Lear. Lear was in need of change after the death of his beloved eldest sister Ann, who had been a substitute mother to him since his early childhood, and he welcomed the opportunity to travel to Italy. Reaching Florence on 8 June 1861, he spent the rest of that month making sketches, writing in colourful terms to William Holman Hunt: ‘Plumpudding – treacle, weddingcake, sugar, barleysugar, sugar candy, raisins & peppermint drops would not make a more luscious mixture in the culinary world, than Florence & its Val d’Arno does as Landscape’ (cited in V. Noakes, 1979, p. 184). Evidently he had a sweet tooth, as his diary records ‘the usual four ices’ eaten on his way home (cited in P. Levi, 2013, p. 183). Lear had long admired Holman Hunt and had spent a summer in 1852 at Clive Vale Farm near Hastings watching him paint. Although Lear was no longer painting in the open air by the early 1860s, his Villa Petraja has Pre-Raphaelite resonances, particularly in the attention to naturalistic detail in the foreground. This emphasis on local colour often presented him with a problem of transition between near and far in his landscapes, but Lear resolves it here with a weighty bank of trees in the middle ground, providing a magnificent foil to the campaniles and domes of the distant city. Lady Waldegrave was pleased with the painting and when Lear wrote to her with his condolences after the death of her husband he expressed his pleasure that she now had the picture ‘of Petraja where you so lately were together…. It seems to me that in converting memories into tangible facts, recollections & past time as it were into pictures, lies the chief use & charm of a painter’s life’ (5 January 1862, L.E.L., 1907, p. 216). We are grateful to Briony Llewellyn for providing this catalogue entry. This entry was posted in Edward Lear and tagged Edward Lear, Italy, landscape, oil paintings. Bookmark the permalink.